My first job as a kid was working at a wholesale greenhouse. As soon as I arrived home from school and changed my clothes, I rode my bike as fast as I could to get to work. The race was on to transplant as many seedlings into new container trays as I could. I loved playing in the dirt and working with the plants (I also loved the twenty cents I received for each tray that I planted!). It was quite a feeling to know that the flowers people were buying at the end of spring may have been the ones that I had transplanted. The experience at the greenhouse inspired me and my best friend to dream of building our own greenhouse. We even drew up sketches! It turned out that I realized that I loved working with children more than plants, but for my best friend, he was lucky enough to follow his passion and now owns his own landscaping business. Lindsay Ward's career as an author and illustrator began at the age of 15 with her first job working at Hicklebee's Bookstore in San Jose, CA. 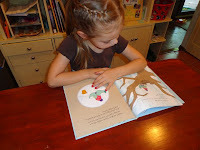 It was here that she, "fell madly in love with children's book illustration." (Respect the Cupcake). 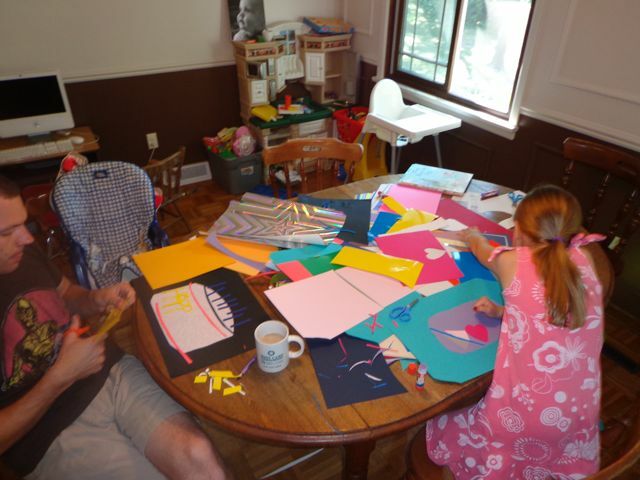 Her experience working at the bookstore led her to study illustration at Syracuse University. She landed her first illustration job after she had "sent out a mailer with a little girl dreaming about space and was lucky enough to have Jennifer Lum, with DoubleDay Canada, ask her to illustrate the cover and four black and white interior spot illustrations for Edward Kay's new book, STAR Academy." (Jacketflap Blog Posts). 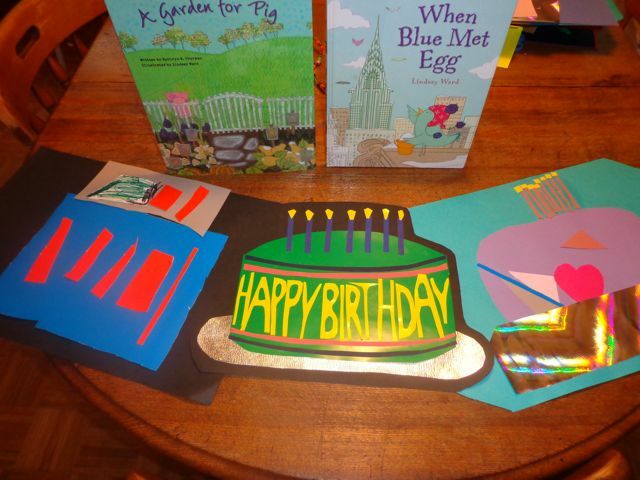 Shortly thereafter, Lindsay illustrated two picture books The Yellow Butterfly by Mehrnaz S. Gill and A Garden for Pig by Kathryn K. Thurman (which my kids really enjoyed!). Luckily her agent suggested to Lindsay that she could also be a writer. "I thought she was crazy. But she was right." (Respect the Cupcake Blog). Lindsay has now written and illustrated two picture books, Pelly and Mr. Harrison Visit the Moon (2011) and When Blue Met Egg (2012). This week, I really enjoyed snooping around Lindsay's blog, Respect the Cupcake. 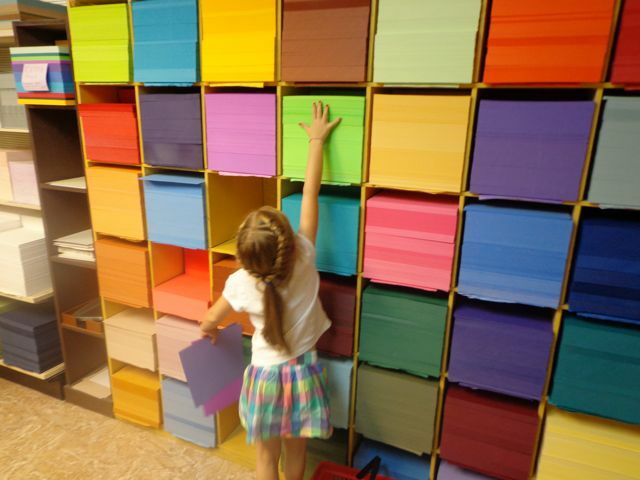 I learned that Lindsay really loves paper. This love of paper has defined her illustration style of cut paper and mixed media. She said in a blog post, "Most of the paper I use is vintage or antique, some of which is as old as the 1800s. I go to garage and estates sales, paper boutiques, library sales, and used bookstores to find materials." When I read this, I remembered a local paper store that my daughter went to a few years ago that she could not stop talking about. I thought it would be the perfect place to visit to celebrate Lindsay Ward's birthday. 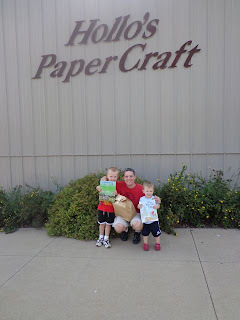 The whole family visited Hollo's Paper Craft in Brunswick, Ohio. I noticed right away why my daughter loved this store. 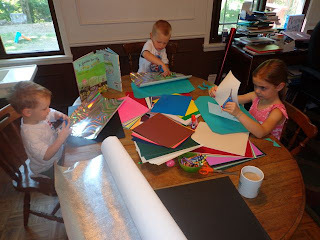 There was just about any flavor of paper that you could want -- heavy card stock, handmade paper, hologram paper, and even scented paper! They were like kids in a candy paper store! My two year old son was excited to be picking out paper too. This shelf had vinyl sheets, decorative sheets, and the scented paper. 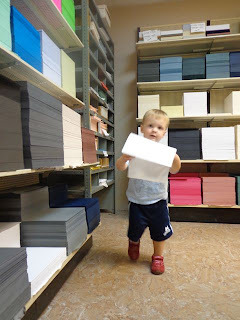 More paper! 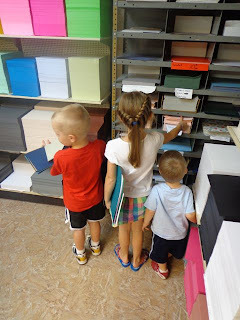 My kids loved the card stock room the best! These sheets were for me! Thanks buddy! 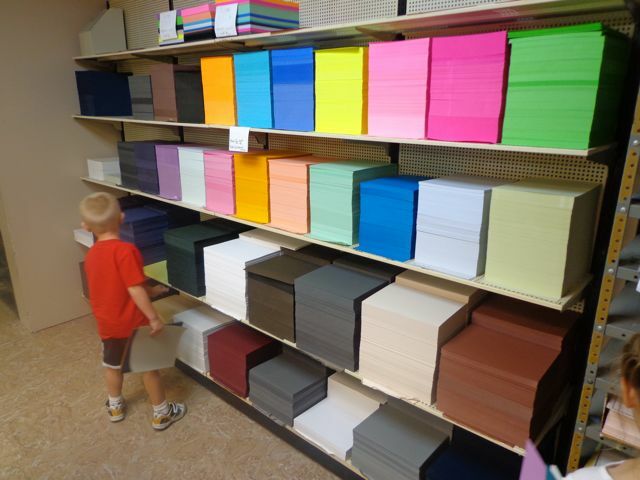 I must have lime green paper! 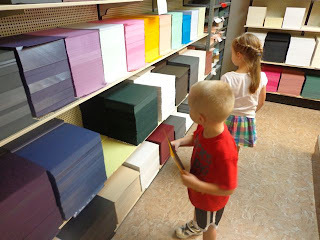 I can only imagine all the things we are going to make with the paper from this awesome store! I think the best birthday memories I have are of my cakes. I have a huge sweet tooth, and when I was a kid my mom always found the coolest cakes. 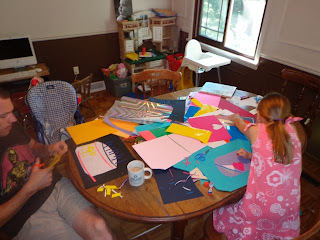 Some of the best ones included a watermelon shaped cake, a big sunflower cake, a massive pineapple upside down cake, a bunny shaped cake, and a record cake (label and grooves included!). But the best cake ever was my Little Mermaid Cake on my 7th birthday. It had airbrushed ocean frosting, marzipan painted to look like rocks and seashells, fish made out of frosting, and a mermaid doll on top, made to look just like Ariel (who I was totally obsessed with at the time). It was the most beautiful cake I had ever seen. Every year I try to keep up the tradition and find a really unique cake or dessert to have on my birthday. After reading Lindsay's birthday memories, I thought it would be fun to make birthday cakes out of the paper that we purchased at Hollo's. I even joined in on this project. 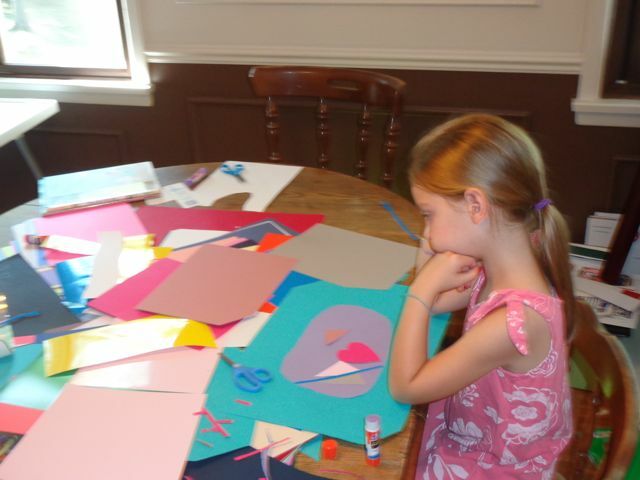 My daughter learned that collage is not as easy as it sounds. 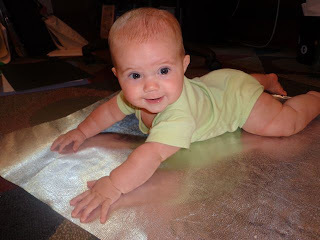 My youngest daughter shows off a giant piece of silver paper. My son glued all of the paper pieces that he cut onto a big piece of black construction paper. Ta-da! 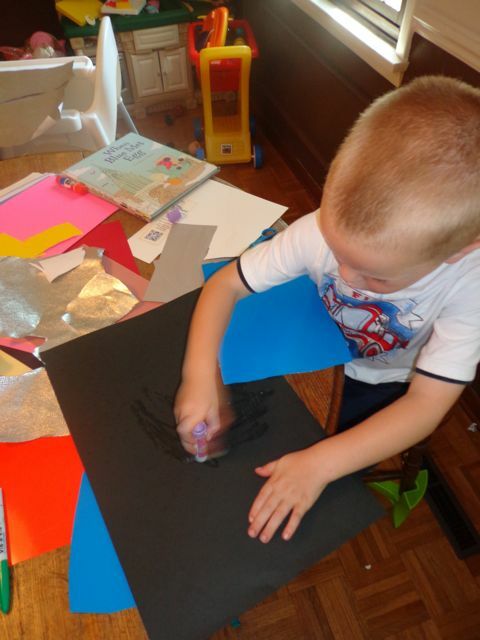 Here are our collages. Happy Birthday Lindsay Ward! We hope you have a wonderful birthday and enjoy eating your birthday cake. Thank you so much for sharing your birthday memories! I really admire illustrators that work with paper. It seems like you have to be incredibly patient. In When Blue Met Egg, Lindsay made the Brooklyn Bridge out of one piece of paper -- AMAZING! Thanks again for stopping by Susanna! This is an author I am not familiar with, Eric, so thank you for the introduction. I love the sound of When Blue Met Egg. That paper store and activity look such fun and I am so glad your youngest daughter got in on the act too! I met Lindsay at a local author fair at our library. She is also a member of our NOSCBWI chapter. She will be part of the faculty for the Fall conference too! Look for more things from her -- I think her agent is still Mary Kole! 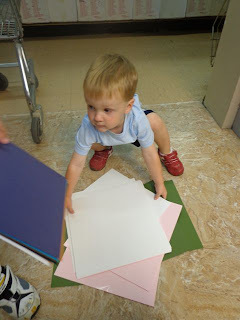 Ooooh, I want to play with that paper! I was not familiar with Lindsay Ward, so I appreciate the introduction. And I was hoping that the littlest one would get in on the act as well! I wrote down the date, September 15th for International Dot Day. Sounds like fun! I think I'm the only person on the planet who hasn't read WHEN BLUE MET EGG. I'm adding it to my library list. Thanks for giving me the nudge. And BTW your baby is so cute! Thanks Kirsten! When Blue Met Egg is delightful. I think you will really like it!